I do think ‘false positives’ have been eradicated from police crime lab vernacular. This FSI article went after “false negatives’ as they say their literature is all about ‘individuation.’ Seems a bit non-sequitor to me as their study is in that very venue. Must be fingerprint person slang for “identifying one person in the entire world’ which the fingerprinters do for a living. At any rate, this is some research about fingerprint examiners and fingerprint features that ‘might’ contribute to eliminating the actual perp. (abstract only). I wonder how well distributed this journal is within law enforcement labs. 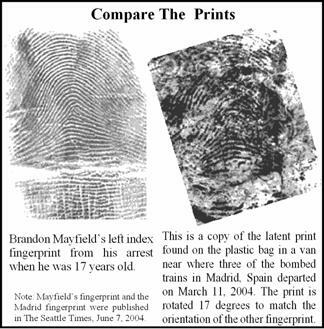 This entry was posted in Forensic Science, forensic science reform protecting the innocent and tagged brandon mayfield false fingerprint ID, fingerprints, forensic examiner error, Forensic science. Bookmark the permalink. It was really a very difficult case and discussed not only in a particular journal but you have it on internet. There are some other cases also where the experts gave disputed opinion to grab the credit for solving the case and for linking the chance print with the criminal.